This is the story of a vampire, a werewolf and a ghost, picked to live in a house to see if they can stop being monsters and start Being Human. 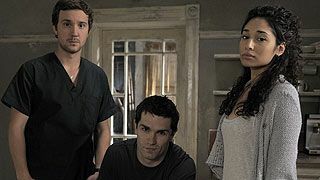 In last year’s first season of the American version of UK hit, Being Human, audiences were introduced to the vampire, Aidan (Sam Witwer); the werewolf, Josh (Sam Huntington) and resident ghost, Sally (Meaghan Rath). The supernatural trio spent 13episodes dealing with their respective addictions that formed the central theme of the first season. In season two, they face even stronger temptations as new complications arise. The Boston brownstone becomes even more crowded with new ghosts, a surprise werewolf and rowdy vampires stirring up trouble. And you thought your roommates were bad. Being Human returns to SyFy Monday night, January 16th at 9PM Eastern. Hit the jump to check out a preview of season two. If you’re new to the series and want to get caught up on all the happenings from season one, SyFy has all 13 episodes available here. I’d recommend checking them out before reading on further as the following may contain spoilers. Fans of the show, however, will remember that Aidan had finished up the season in a bit of a quandary, having taken on new responsibilities as the de facto lead vampire in Boston. 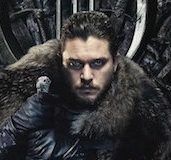 Things won’t be getting any easier for him in season two as some vampires from his past will arrive to complicate his attempts at leading a normal life. 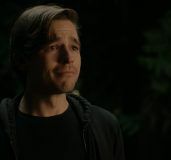 Equally as complicated is the life of resident werewolf Josh and his girlfriend, Nora (Kristen Hager). While many fans will see this “surprise twist” coming, the real twist comes from the crossover danger from Aidan’s new alliances. The temptation I found most interesting is the one that lures Sally. As a ghost for about a year now, Sally doesn’t really get out much. 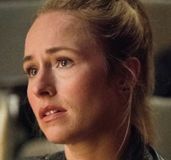 When she decides to go to her high school reunion post-mortem, she meets up with Stevie (Robert Naylor), a former classmate who committed suicide. While Stevie himself isn’t necessarily dangerous, his other friends prove to be as they introduce Sally to the addictively harmful pastime of body possession. This was a fantastic twist in the first season that will open up the story to lots of interpretation in season two. To hear more about what you can expect from the upcoming season of Being Human, watch the video below to hear it from the cast and crew themselves. Tune in tonight at 9PM Eastern, only on SyFy.